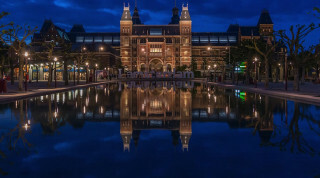 Revamped heritage buildings set the scene for two of the Dutch capital’s latest hotel openings. This 274-room property’s use of deep blue—from the Delft-inspired graphic tiles in the bathrooms and reception area to the walls of its in-house bar—bring a special, undeniable charm to the hotel. Here, blue becomes the warmest color. Bedroom at the Kimpton Amsterdam. All photos courtesy of the respective properties. 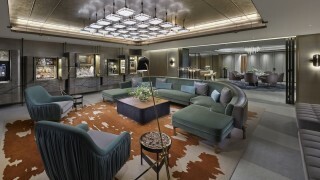 The first European hotel from the San Francisco-based brand, Kimpton De Witt is located in the capital’s Palace Quarter. 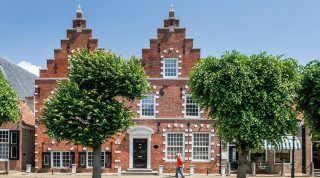 It is situated within three buildings dating back to the Dutch Golden Age in the 17th century. It’s proudest of what it calls the “Little House,” a three-story structure dating from the 1600s that used to be the home of historian and playwright P.C. Hooft. 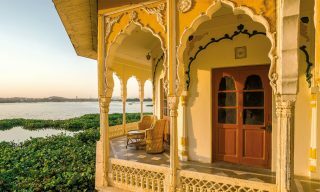 With two king-sized bedrooms and a separate living room, it offers guests extra privacy while giving them a glimpse of the country’s history. 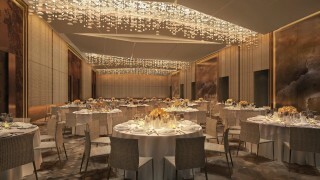 The Kimpton’s public living room. The other rooms were designed in palettes of black and white. 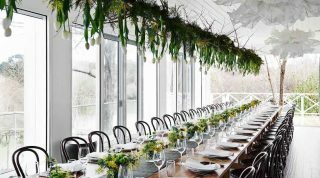 Solid custom-crafted desks, sleek Atelier Areti bird lamps, and floral-and-insect printed upholstered chairs provide a welcoming cocoon to guests. 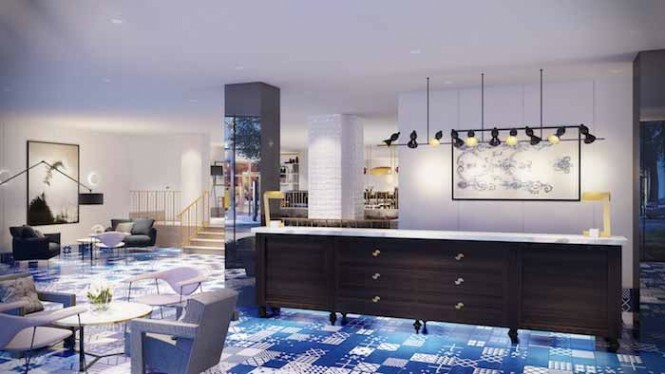 Delft-inspired tiles bring character to the reception area. Botanicals are also an omnipresent theme. A “living wall” of plants draws the eye towards the entrance. 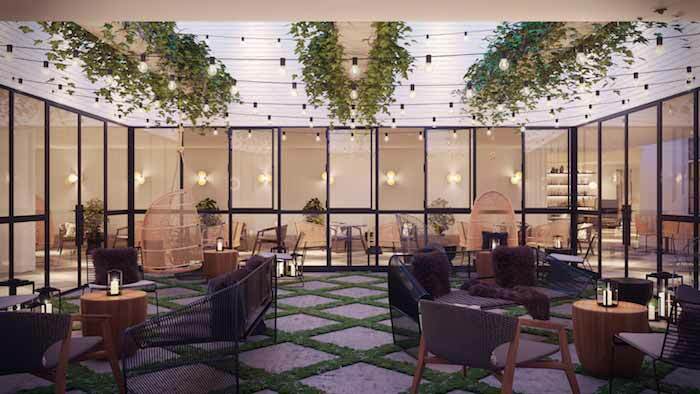 Vines have been strung across on the public living room’s ceilings, lit up by the soft glow of light bulbs that illuminate swing chairs and other furniture underneath. 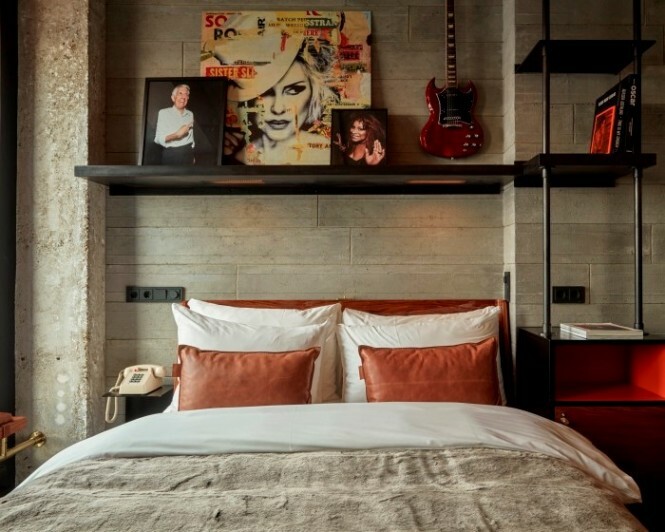 Music is a ubiquitous influence in this contemporary, 108-room hotel, which counts recording company Sony and guitar brand Gibson as its neighbors. Sir Adam’s rooms provide an impressive view of the nearby port. 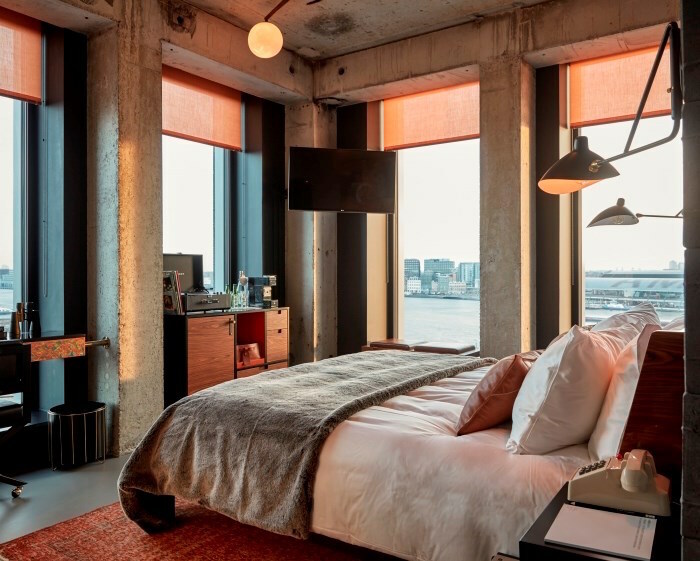 Located in the 22-story creative hub A’DAM Toren tower,a reinvented 1970s landmark, the property’s industrial-themed rooms come with amenities that audiophiles like. There are Crosley Cruisers turntables and a collection of vinyl records; sleek Gibson acoustic guitars; portraits of rock stars; and mirrors carefully etched with song lyrics. It doesn’t hurt that there’s also a music library offering an extensive range of Bluetooth-accessible records. This is not to say that guests’ comfort is secondary to cool aesthetics. 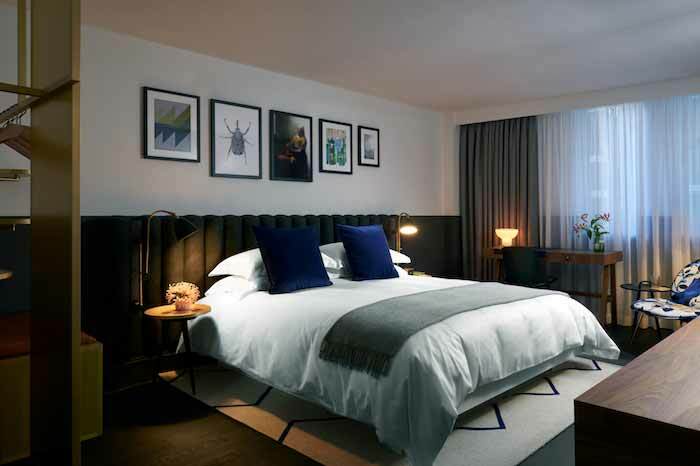 Calacatta tile-outfitted bathrooms come with rain showers; floor-to-ceiling windows bring sweeping views of the nearby port as well as natural light; and beds come with 300-thread count linens. Musician’s portraits and Gibson guitars can be found in each room. 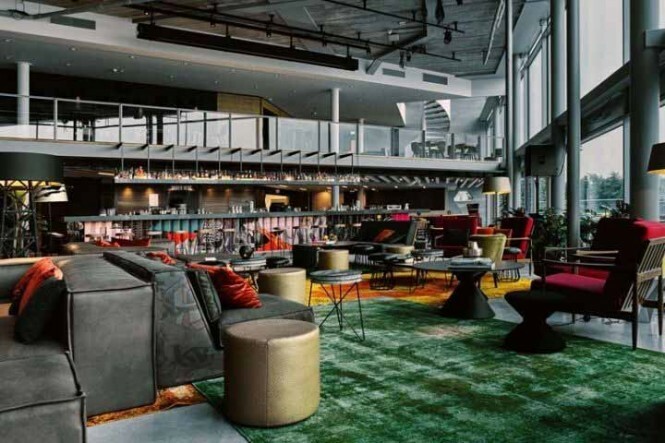 A member of Design Hotels, Sir Adam provides ample spaces for guests to rest and mingle. Inside the double-height lobby, The Butcher Social Club comes with a gourmet burger joint, an island bar, game tables, live DJ sets, and swing seats. If you’re a fan of craft beer, grab a pint of suds and hang out at the rooftop Beergarden, a drinking den that offers panoramic views of Amsterdam.